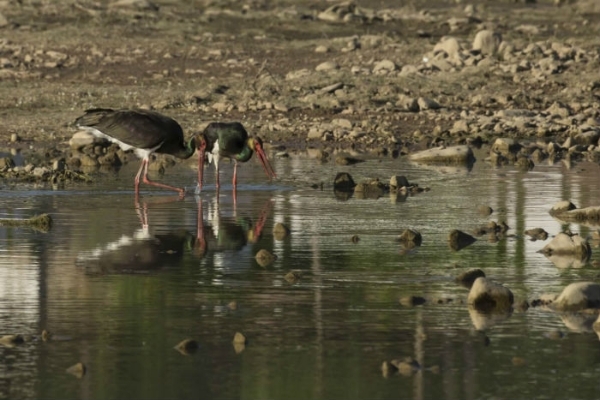 Staff at Miyun Reservoir, Beijing's largest reservoir, recently caught pictures of several endangered black storks, signaling improvement in the reservoir environment. Wang Zhiyi, who took the pictures, said he first discovered the birds in December 2017 at a river estuary of the reservoir. He has been observing the birds during the past month and caught pictures of six black storks. Black storks (Ciconia nigra) are on the red list of threatened species by the International Union for Conservation of Nature. There are only about 2,000 such birds in the world. Staff with Beijing Wildlife Rescue and Rehabilitation Center said the birds usually live in the wild. There have been no record of spotting the birds around Miyun Reservoir in recent years. Thanks to the south-to-north water diversion project and more rainfall, water stored at the reservoir has been rising in quantity, which surpassed 2 billion cubic meters in November 2017 for the first time since 2000. Efforts have also been made to improve the environment of the reservoir and the rivers that feed into it. The aquatic ecosystem has been improving and the coverage of wetlands in the area has been increasing, attracting more birds. "Two years ago, there were only hundreds of egrets and grey herons at the reservoir, but in last autumn, the number of the two kinds of birds exceeded 3,000," Wang said. Since December 2017, Beijing started to set fixed feeding sites offering food to help black storks survive winter.